The other day I was looking at my bathroom window and trying to decide whether I wanted to purchase a curtain or not. Then, I came up with the brilliant idea of knitting one. 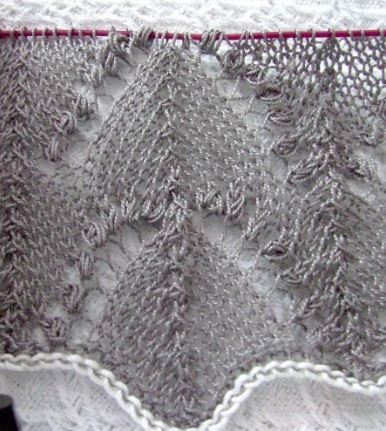 As I have a lot of knitting shawl patterns, I chose to use one that called for a “Lilly of the Valley” lace on the bottom edge. Of course, that called for working with “Nubbs”,- you know, that stitch that calls for you to YO, knit one umpteen times, then purl all those loops together on the next row. The results of this endeavor was that I came up with a short tutorial with some tips on how to handle the process so that my Nubbs were neat, and easier to purl together. This will look a lot better when it is blocked , but at least you can get an idea of what I am talking about. My bathroom is grey, white and pink, so I opted for this silver lace cotton yarn from Knitpicks. I hope this little tutorial will be of some help. I mainly wrote is up for myself, so I can remember how I did it. One more tip- if you you find one with a loop not laying right, on the knit side, you can insert a DPN into the center of the loops and gently work the slack out.